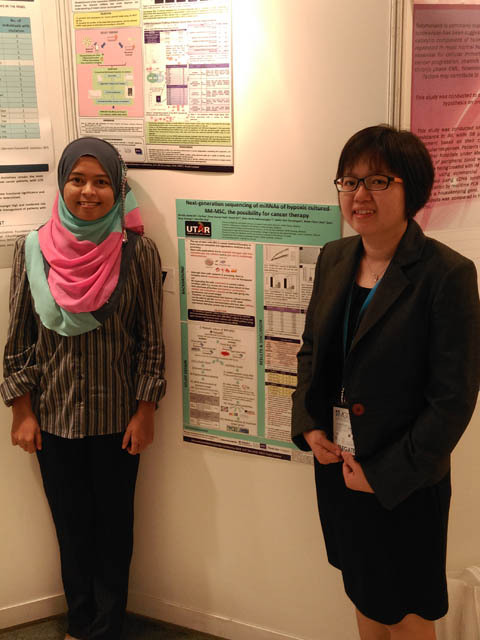 Norlaily Mohd Ali and Boo Lily, both PhD candidates from FMHS, made the University proud by sweeping two out of three Best Poster Awards at the International Medical Genetics Conference (IMGC) which took place from 3 to 5 December 2014 at Putra World Trade Centre, Kuala Lumpur. IMCG 2014 was organized by the Medical Genetics Society of Malaysia with the aim of highlighting and exploring advances in the medical field to improve cancer care with the latest DNA technologies such as targeted treatments, prevention and prognosis. Norlaily’s research, titled “Next-generation sequencing of miRNA of hypoxic cultured BM-MSC, the possibility for cancer therapy” and Lily’s “Differential miRNAs profiling expression associated with three-dimensional structure of cancer stem cell-like spheroid model derived from human breast cancer MCF7 cells using Next Generation Sequencing (NGS)”, incorporates the latest sequencing platform available in Malaysia “Illumina next generation sequencing” to elucidate the expression profiles of small RNAs. This new technology has introduced time and cost advantages over the first-generation sequencing, Sanger sequencing. As emphasized by the plenary speaker Dr. Marcel Nelen (Netherlands), the use of NGS is not just limited to research but also for clinical and diagnostic settings. The projects were under the supervision of Associate Professor Dr. Alan Ong and co-supervision of Emeritus Prof. Dr. Cheong Soon Keng. Both recipients of the award are very grateful to UTARRF (6200/A14 and 6200/A15) as well as MOSTI E-Science Fund (2012-2014) for funding the projects and to their team members which includes collaborator, Dr Yeap Swee Keong, from Institute Bioscience (IBS), Universiti Putra Malaysia and Dr Ho Wan Yong from The University of Nottingham Malaysia Campus. The two and a half days conference attracted over 500 participants covering a range of experts in the medical genetic fields from renowned public and private universities and also private organizations in Malaysia. The esteemed plenary speakers were from Malaysia, Netherlands and the United Kingdom, covering and exchanging views on human cancer genetics.